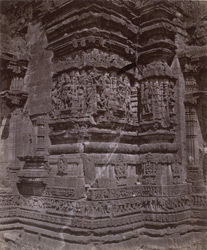 Photograph of the façade of the Ekalinga Temple, Eklingji, taken by O.S. Baudesson in 1882. Eklingji is situated in the Rajsamand district of Rajasthan,12 miles north of Udaipur. The town is best known for a large Hindu sanctuary built close to a small lake. The Ekalinga Temple is located in this compound and is dedicated to Shiva Eklingji, the tutelary deity of rulers of Udaipur of the 15th Century. A four faced image of Shiva is located inside made from black marble and facing it is a silver Nandi. The temple's interior, and the doorway in particular is decorated with silver. The temple consists of a sanctuary and a two-storeyed mandapa surrounded by a solid wall. These structures are built on a stepped plan and are made of marble. The sanctuary is covered by a clustered spire and the mandapa roof is made by a pyramid of architectural motifs. The photographs shows the sculptures that decorate the outer walls and the friezes on the mouldings of the basement.